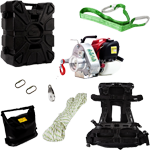 This multi-purpose kit is perfect for those who play outside and need to pull loads from time to time. 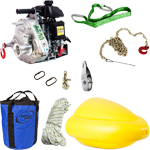 Think about cottage owners or waterside dwellers, tool junkies, small woodlot owners, hunters, motorsports enthusiasts and many more. In short, this assortment is ideal for works of all kinds. 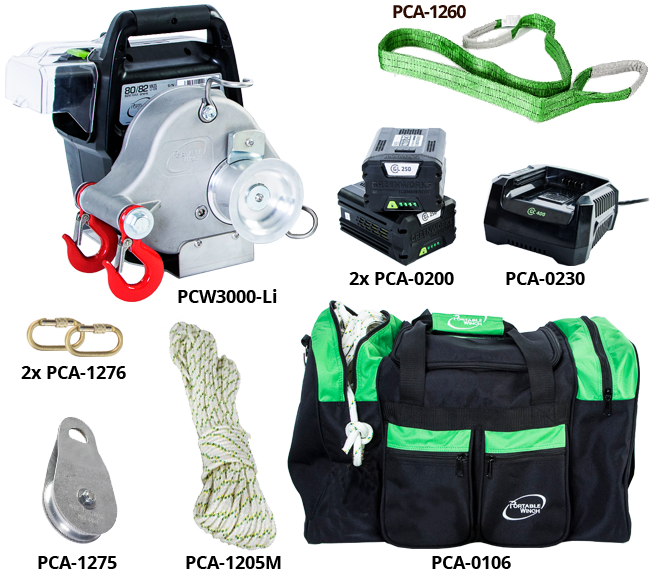 In addition to the battery-powered winch, 3" single pulley, 3/8" x 165 ft. rope, carabiners and slings, this kit includes a charger and two 82V batteries. In order to protect and carry all the items where they are needed, we designed the new transport bag (PCA-0106). 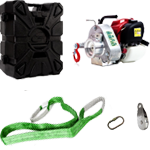 Three compartments can accommodate the winch, charger, batteries, rope and slings. Two pockets are perfect to store pulleys and carabiners. It also features strong handles and a shoulder strap. Gear Box and Gears Aluminum alloy gear box. Heat treated 3 stage spur gears. Shafts mounted on ball bearings. Oil bath lubrication. Double braided polyester. Unlimited length. 19" x 15" x 13"